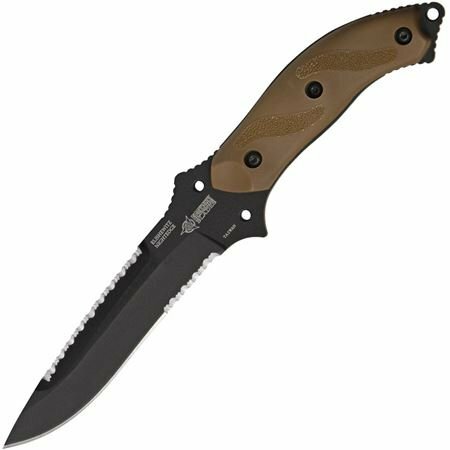 The night edge is a full-sized Fixed blade knife from BLACKHAWK! that was inspired by the original Mod night wing. This Allen elishewitz designed knife has a serrated back edge that optimizes the knife's utility and combat potential by providing a secondary edge suitable for heavy cutting, back cuts, and draw cuts. This unique grind also produces a reinforced point for extreme tip strength and penetration. Ground from tough 1085c high-carbon tool steel and coated with a non-reflective, corrosion-resistant black epoxy coating. The night edge comes equipped with a sheath that supports carry on belts, load-bearing equipment, and MOLLE platforms.